getcalc.com's Resonant Frequency Calculator is an online physics tool to calculate the number of oscillating frequency generated by LC (inductor & capacitor) circuit per second. 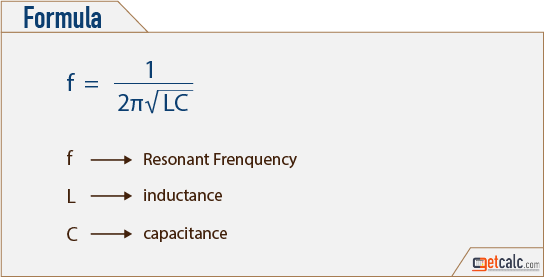 Resonant Frequency is the physical quantity generated by the RLC or LC circuit due to inductive & capacitive reactance in equal magnitude causing electrical energy to oscillate between the inductor's magnetic field and capacitor's electric field. The level of inductive & capacitive reactance determines the amplitude or magnitude of the resonant frequency. The physical phenomenon of oscillation is called as Resonant Frequency and it is measured in Hertz (Hz).